The circular shape is a traditional symbol of welcome, blessing, bounty, gratitude, inclusion, wholeness, and the cycle of changing seasons. 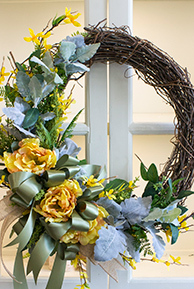 Including trend-friendly contents such as burlap ribbon and dusty miller, this springtime wreath will bring a breath of fresh air into your home decor! Class is held Saturday afternoon, April 13 from 2:00-3:30pm at Viviano Flower Shop, 32050 Harper Ave., St. Clair Shores, MI 48082. Please arrive early for registration completion if not already paid in full. An actual sample of the design you'll make your own is shown.